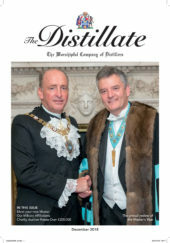 The Scottish Distillers Dinner was held again at the Signet Library in Parliament Square Edinburgh. It is owned by the Society of Writers to her Majesty’s Signet known as the WS Society – a society of Solicitors. It was the best attended Scottish Dinner so far with one hundred and sixty two dining and of this number forty were Liveryman plus the Master and his Wardens, five Past Masters, three Assistants, one Hon Assistant, three Hon Stewards and one Steward. The guest list represented a fair cross section of people involved in all aspects of the Scotch Whisky Industry. Our Honorary Liveryman Lord Robertson of Port Ellen KT, GTMG, PC proposed the Toast to the Livery and Mr Findlay Calder OBE ( he of Scotland, former British Lions Captain, Grain Merchant and now Distiller) responded on behalf of the Guests. During the course of the evening the Master presented a cheque to Ms Helena Coonibear for £50,000.00 from the Distillers Charity Fund to support the Alcohol Education Trust’s recently established Scottish presence. He also thanked Ian MacLeod Distillers for the provision of Isle of Skye Whisky and their Edinburgh Gin, Gordon & MacPhail for their Benromach Single Malt Whisky. At the conclusion of dinner (excellent food and wine) the Master invited everyone to join him for a Stirrup Cup little realising that the bar would remain open till midnight!. Vintners Hall and other Livery Halls please note…! Earlier at the Court Meeting Messrs Ken Robertson and Michael Urquhart became Honorary Stewards of the Company.